This is The Celtfather. My name is Marc Gunn. I'm here with The Irish Bard, Andrew McKee. 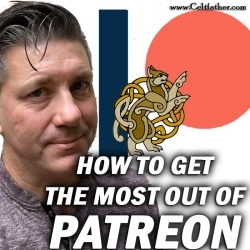 Today, we're gonna give you a Patreon Primer, to help you better understand how to get the most out of Patreon. I've been using Patreon since 2014. However, it really wasn't until I started the account for the Brobdingnagian Bards that I really realized that a podcast like this would be super useful. I have a lot of friends on Patreon. And Andrew is planning his own Patreon. I thought we'd talk about some of the awesome things you can enjoy and how best to do that. Sign up for different levels. Each offers progressively more access to our creations. This is the easiest way to interact with the community. It's not superbly sophisticated, but you can comment and reply to comments. You can ask questions, and get answers.You can also listen to podcast episodes directly from the app, either downloading or streaming the episode directly in the app. It saves your space. You can fast forward in 15 second increments or you can drag the slider to different points in the podcast. If you have a preferred podcatcher, you are also given a personal podcast feed that you can insert directly into your podcatcher. That's how I prefer to listen. Now if there are albums or singles you want in a blog post, you'll probably need to use your desktop computer. You can listen directly in the app, but it's kind of annoying. I would prefer to download them and put them directly into my iTunes. Patreon doesn't currently offer a great search feature directly in the app or on the desktop version.That said, Patreons best option is the tag feature. We try to tag every post that we make with simple, easy-to-figure out tags.ie. "bootlegs" are our live concerts. "A Brobdingnagian Minute" will load all of those podcast episodes. "MP3" is the free mp3s that we share. "vlogs" are video blogs.Go to the Posts page on the desktop. You'll see tags on the lefthand side. Just click one and get the desired content. If there's a better way, let me know. Did we miss anything? Is there something you like about it or that you think would make Patreon better? Post in the comments.